As we are still celebrating a triumphant season, your favorite infinitely knowledgeable, terribly clever, and unabashedly humble Milan bloggers decided to look back on 5 categories of the season and remember our favorites for each. Jovan: Thiago Silva - every house is built from the foundation up and the same goes for every title challenge. We've grown accustomed to flawless performances from the Brazilian to the point we take him for granted. The central figure of Milan's title-winning defense has a magnificent positioning sense that helps him make the most of his pace, strength and tackling. It also allows him to be one step ahead of the opposition which, in turn, means he doesn't have to make reparation fouls - as evidenced by his stunning tally of exactly 1 yellow card in 32 games. Elaine: It will come as no surprise to anyone who knows me that Christian Abbiati is my favorite player of the season. I have always loved goalkeepers, something about being the very last line of defense has always seemed equal parts insane and heroic. And Abbiati exemplified both this season in fantastic style, keeping clean sheets in 19 of the league games, and providing a huge highlight reel worth of spectacular saves with absolutely zero drama on or off the pitch. Jovan: Zlatan Ibrahimovic - Say what you will about his character, but he will win you the title. His contribution in the first half of the season was enormous, he took on the role of the leader and single-handedly decided some games that would have ended in a stalemate without him. As the jadedness caught up to him, resulting in frustration and disciplinary problems, his contribution declined but by then the team was strong enough to maintain the lead at the top without him. He is largely responsible for bringing back that winning mentality to Milan. Elaine: Massimiliano Allegri. I know this should be a player, but Allegri brought structure, discipline, hope, heart, calm, and good old fashioned tactical intelligence to a club filled with talent, but void of most of the above. If Massimiliano means the greatest, then Allegri was very aptly named. Jovan: Milan-Inter 3-0 - At the moment it looked like the race would be wide open, as Inter had found a way to the second spot, only two points behind Milan. 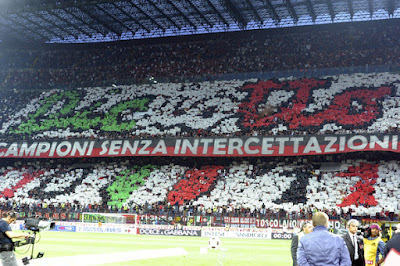 The build up for the derby was tremendous and Inter's hopes were high. Once the game started however, it only took Pato 40 seconds to score and Milan went on to dominate the game, sending Inter back to a safe distance, thus making the decisive step towards the title. Elaine: Milan-Inter 3-0. Forget about what this loss did to Inter’s morale, Milan needed the late-season morale boost for not only a huge win, but a most symbolic win. Considering the suspension of Ibra and our doubts as to whether we could cut it without the big man, this win proved to ourselves that we could actually do this thing. Jovan: hard to tell...I'd like to split this category into two - most beautiful goal and most important goal. For most beautiful, I'd say Ibra's goal against Lecce where he pushed two defenders out of his way and hit the net with his left foot from 30 yards out. 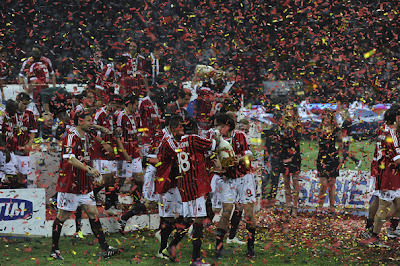 As for most important, again it's Pato's first minute goal against Inter that paved the way to victory. Elaine: I can’t pick just one. Pirlo’s wondergoal vs. Parma still takes my breath away, I can never get over that man’s exquisite talent. Gattuso’s goal vs. Juventus was enormous not only for the epic battle that we were engaged in, but also for the fact that it was Gattuso. I still pinch myself in disbelief on this one! Jovan: The whole day of the game against Cagliari - the celebration in Milan's city square, the game in which Milan danced to a convincing triumph and the ceremony afterwards can be summed up into one long moment of joy and, in a way, relief. Elaine: Pippo’s return during the triumphant Cagliari match. He didn’t do anything spectacular in the 7 or 8 minutes he played, but the chants and applause of the 80,000 in attendance told just how important it was to see an aging player who exemplifies the Rossoneri fight back from a lengthy injury and make it back to the pitch, even if only as a sub. Fan Favorites: What are your 5 favorites? Copy & paste the list below and tell us your favorite in each category.